When I got Narumol “Nong” Poonsukwattana, of Portland-based Nong’s Khao Man Gai fame, on the phone a few weeks ago, I wasn’t planning on asking her about how life had led her to where she is now. This doesn’t mean that I wasn’t interested in it. I was. Very much. It doesn’t mean that the subject didn’t come up during our long phone conversation, either. It did. Frequently and in a somewhat in-depth manner. It’s just that that facet of her life has already been captured in various places, such as this piece by Amy McKeever. Besides, I wanted to present something a bit different here. What did I want to present? A Thai cook. Able. Determined. Gutsy enough to build her business around one dish. One. Dish. Imagine a Thai joint with one dish. To those whose exposure to Thai food has been solely through Thai restaurants in the US, it probably seems like I’m asking them to visualize a Walmart with nothing but men’s socks, a Neiman Marcus with dinnerware only, or a Target full of desk lamps and nothing else. But what Nong does is how things are generally done in Thailand. That is to say, a typical Thai eatery is not like a Walmart. Each restaurant, eatery, stall, or food cart usually sticks with one dish or one family of dishes. A rice-curry shop sells various things—that’s true—but they’re all non-fancy, everyday dishes that you can plop on a plate of rice and call it a quick meal. Likewise, a noodle joint offers a variety of combinations, but you can tell they all belong to the same family and come from the same noodle-y gene pool. A pad thai vendor who cooks with a wide carbon steel pan sometimes offers a couple of other dishes that are best prepared in the same type of pan and have some common ingredients with pad thai, e.g. pan-fried mussel fritters or pan-fried Chinese-style steamed turnip cakes. There are many other examples, but the key thing is that there is always a theme and that specialization is a virtue. At a risk of belaboring the point, a Thai restaurant that serves pad thai, mee grob, grilled chicken, northeastern Thai minced meat salad, satay, etc., under the same roof is akin to a stateside restaurant that offers gumbo, Philly cheesesteaks, deep dish pizzas, smokehouse barbecue, and raw oysters on the half shell with mignonette on the same menu. Nobody’s saying it can’t be done. But it should be clear to all that the longer the list, the more difficult it is to do anything well. Yet, this is the way it has always been, most likely to ensure survival or profitability of a Thai restaurant on a foreign soil. It could also be intentional and based on a belief that Thai cuisine is best presented to the world in the same manner that an introductory survey course is presented to first-year college students (example here). But let’s get back to Nong and her food cart selling one thing. Khao man gai, the Thai version of Hainanese chicken and rice that has been much loved in Thailand for decades, is a dish that, when done commercially, requires such specialized skills. And it was most likely the fact that Nong was willing to take just this dish — a complete meal on one plate — and focus on making it good that made her successful. In fact, it would not be an exaggeration to say that Nong had put the name khao man gai in the American vernacular so that it’s now right up there with its better known friends, such as tom kha or tom yam, that go by their proper, as opposed to descriptive, names. Before Nong’s Khao Man Gai, the people in the US who knew this dish existed were mostly those who came from or had lived in Thailand. Nong’s decision to start a food business producing one dish to satisfy a nonexistent raging demand is the kind of thing that makes marketing gurus gasp in horror. And I’m sure people had tried to talk her out of it in the beginning. Wasn’t she scared? Nong humbly attributed her brave decision to the budget which was so meager that it would not have allowed her to start a full-scale restaurant with 100 things on the menu even if she’d wanted to. Starting this food cart wiped her out financially. She had no choice. She had to make it work. One of those things was how hard it is to make money and succeed in this business. It’s not just a matter of having an idea and running with it. Ideas, as the cliché goes, are a dime a dozen. And starting a food business based on the ability to cook well alone has resulted in so many shattered dreams not to mention bankruptcies. And the way this artist wanted it was to be different. She would start a food cart on a shoestring and sell just one thing — customers be darned. Oh, and come early, because as soon as the food ran out, she’d be gone for the day. Forget the kind of restaurant that operates on a fixed schedule. But over time, Nong had, in her own words, softened up — grown up. It’s easy to be philosophical and idealistic when you’re watching from afar. But there’s nothing like actually doing something, investing every ounce of your energy making it work, that makes you appreciate those who work hard and empathize with those who perhaps wish they could do what you do but cannot due to various reasons. The stake is lower when you’re single and not financially responsible for anyone other than yourself, when you can afford to change directions fairly quickly. Someone with, say, two kids in high school and one in college, on the other hand, will have to think much longer and harder about taking a risk. Nong realized the unique set of factors that had led to her success, including the open-mindedness and culinary savviness of Portlanders. Those slow, contemplative days didn’t last very long. People started noticing, and her name started popping up in the press more frequently leading to even more attention. Nong’s Khao Man Gai is now a thriving business that has expanded to multiple locations — with a line of bottled sauce to boot. I must say that, throughout our conversation, Nong struck me as a woman of empathy, one of the most admirable qualities a human being can ever have and, in my book, a sign of true intelligence. Nong’s confident, but her confidence is not tainted by arrogance. That much is clear to me. And I can’t tell you how much joy it brings me to see a hard-working, talented fellow Thai expat in the US enjoy well-deserved success in the business that is notoriously tough. It used to be that Thai restaurants overseas were where specialized culinary skills came to drink themselves to a numb stupor. Apparently, things are changing. Would the success of Nong’s Khao Man Gai inspire a new wave of specialized Thai restaurants in the US? I hope so. Since tradition dictates that every interviewee must share a recipe with my readers, Nong has given you a recipe for another one of the most popular Chinese-influenced one-plate meals in Bangkok: khao kha mu (ข้าวขาหมู, literally rice (with) pork leg). This recipes comes from her mother, a professional cook in her own right. Rice topped with voluptuous pork legs stewed for hours in gently bubbling soy-based and spiced liquid is wildly popular in the city; you can find a khao kha mu shop anywhere. Let’s talk about khao kha mu first. It’s a dish that has not yet become widely known among Thai food fans in the US. Why? Yes, it’s another one of those dishes that require specialized skills. 1. To be true to the definition of the dish, you must use a pork leg (I’m a hind-leg girl, but you can use a front leg aka pork picnic shoulder) or pork knuckles or hocks. No pork loins, tenderloins, or anything else here. Leave the bones in. Leave the skin on. It may look like an excessively rich dish, but I would say it is more about the collagen than the fat. Having said that, this is what makes khao kha mu great — the fact that it’s, you know, um, not lean. 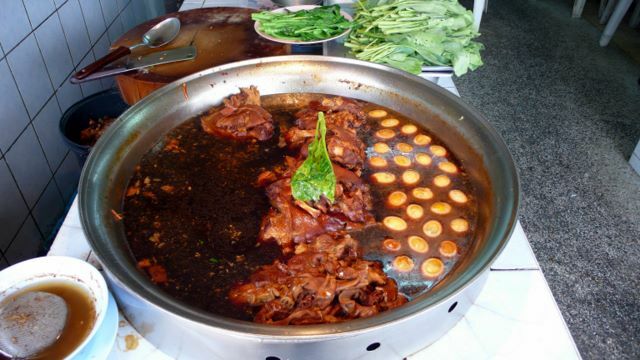 I can confidently say that I’d rather have 3-4 bites of properly made stewed pork leg, complete with the fat and the skin, than a full plate of “lite” kha mu made with a skinless, lean cut of pork. 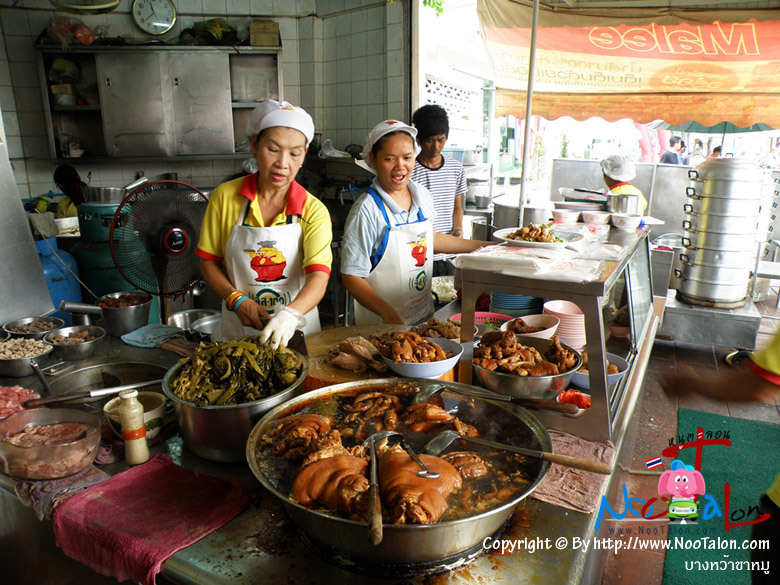 True, there are calorie-conscious street diners in Bangkok who order their rice with stewed pork hocks without the skin, and the vendors are usually happy to oblige. Yet, keep in mind: the reason those leaner morsels taste good is only because they have been swimming for hours in the same pot with the richer parts of the pork. Deliciousness by association and all that. So if you must discard the skin, do it — wait, let me wipe these tears off my cheeks — but at least would you promise me that you will leave the skin on the pork hocks as they cook? 2. The more traditional choice of side vegetable is pickled/soured mustard greens (which come packed in their pickling liquid, in clear plastic pouches and are found either in the refrigerator or dried goods aisle of an Asian store). But you will also see kha mu vendors who offer the tender parts of Chinese broccoli (kai-lan — don’t confuse it with yu choy; see a side-by-side photo here) in lieu of or in addition to the pickled mustard greens. I like how the tart mustard greens balance out the richness of the pork, so I lean towards the more traditional choice. But the recipe below offers you both options. To prepare the pickled mustard greens, take the greens out of the vacuum bag in which they come, rinse them under cold running water to get rid of the excess pickling liquid, squeeze them dry, core them, and slice them crosswise thinly. I sometimes halve the larger ribs lengthwise before slicing them crosswise. To prepare the Chinese broccoli, I usually cut the leafy parts crosswise into 2-inch pieces and slice the stalks diagonally and thinly so that the tough fiber that runs along the length of the stalks is shortened, making it easier for you to chew the stalk pieces. If you can’t find either the pickled mustard greens or the Chinese broccoli, baby bok choy, which should be available at any mainstream grocery store, can be used in a pinch. Simply quarter them lengthwise and follow the same directions below that apply to the Chinese broccoli stalks. Regular broccoli florets may work for some; I just don’t like them in this dish. For what it’s worth, I don’t like spinach in this either. 3. You will find out when you scroll down to the recipe that Nong’s mother uses Coca-Cola in this recipe. This is obviously not traditional, but it works. (Regardless, keep this between us and don’t alert the purists.) The soda provides the sweetness, the color, and the depth of flavor to the dish. People often put different ‘secret’ ingredients in their own versions of traditional dishes these days. One of my aunts swears by Dutch-processed cocoa powder in her kha mu cooking liquid. Some people even add Ovaltine to it. I tested Nong’s recipe 4 times and I have found that it’s the flavor of the soda that matters, not the effervescence. This means that you can — and should — let it go flat before using. This also minimizes mess and the unsightly foams that you need to skim off the surface. Can you use diet Coke? I guess you can, if sugar is the concern. If it’s the calorie count … I don’t know how much difference it’s going to make in a pork leg dish. But to answer your question, yes, you can. 4. After the pork hocks are fished out of the pot, you will be left with plenty of clear liquid. This is the liquid in which you will blanch your side vegetable of choice. Yet, after that is done, it will still seem like a lot of thinnish liquid. And you will experience an understandable urge to reduce it, to concentrate it, to make it more sauce-like. Street vendors don’t do that, though. They need lots of this liquid to baste and keep the pork legs moist throughout the day. They also drizzle the unthickened liquid over the rice and the pork before they serve it to you. What’s left of this cooking liquid will be kept for the next batch which results in the flavor building up and intensifying with each successive batch. In fact, this is what Nong does and suggests that you do as well. I had never done this before I tried her recipe, and I can tell you that my 4th batch tasted a lot better than the 1st one. 5. You will find that the chili-vinegar, or what I consider the mandatory seasoning sauce, is extremely helpful in brightening up this rich, slow-cooked dish. I highly recommend that you make this the day before, so the chilies and garlic can mellow out overnight and don’t taste too harsh and raw when you eat it. Puree 1/2 cup white distilled vinegar with 2 cloves garlic (peeled), 1 fresh Thai red chili, 1 teaspoon sugar, and 1/2 teaspoon salt in a blender (or you can grind the solids in a mortar and stir the paste in the vinegar later). But if you’re the type that has vinegar with pickled chilies around at all times, as I do, you can measure out 1/2 cup of the vinegar and replace the fresh chili with about 2 tablespoons’ worth of the pickled chilies, then proceed as directed above. Same result. Soak the mushrooms in the warm water and forget about them for now. Put the cinnamon stick and star anise pods in a small skillet; toast the spices over medium heat, stirring constantly, until fragrant, about 2-3 minutes; set aside. Pour the soda into an 8-quart stockpot. Add the prepared paste, toasted spices, salt and oyster sauce to it; mix well. Pick the mushrooms out of the soaking liquid and throw them into the soda pot. Strain the soaking liquid to get rid of any gritty sediment; keep the strained soaking liquid; you'll need it later. Rinse the pork leg or hocks, pat dry, and add to the soda mixture. Put the stockpot on high heat and bring the liquid to a boil. When the liquid boils, close the lid, turn down the heat so the liquid is simmering. Let the pork cook for 3 hours, checking every hour to make sure the pork is submerged. Replenish the liquid with the reserved mushroom soaking liquid and more water, as necessary. Now that you have 3 hours to kill, prepare the vegetables. If you use pickled mustard greens, take them out of the bag, rinse them under cold water, squeeze them dry, core them, and slice them thinly crosswise (see post). If you use Chinese broccoli, cut the leafy parts crosswise into 2-inch pieces and cut the stalks diagonally into ¼-inch-thick slices. Set them aside for now. If you haven't made any rice, steam some jasmine rice now. You're going to need 4-6 cups of cooked rice. At the 2.5-hour mark, gently drop the hard-boiled eggs into the liquid. After 3 hours, the pork should be tender but still hold its structure. The skin should plump up and be soft with a bit of bite to it. Take the pot off the heat. Transfer the pork from the pot to a large bowl to cool. This can be tricky. If you use pork hocks, a large slotted spoon may be enough to get them out of the pot without much difficulty. But if you use one large pork leg, you figure it out what tool(s) in your kitchen will help you do that successfully. Two very sturdy metal spatulas, perhaps? Wow, that was pretty messy, wasn't it? You're not done yet. Fish the mushrooms and the eggs out of the pot as well and transfer them to the pork bowl. Let the pork, mushrooms, and eggs cool under a foil tent. Fish out the spices and discard them. The only thing left in the pot right now should be the stewing liquid which looks pretty thin to you and you will feel tempted to reduce it to concentrate the flavor or even to thicken it and turn it into some sort of gravy. If so, please dismiss those thoughts. Put the pot back on medium high heat. When the liquid is boiling, add the sliced pickled mustard greens to it and stir them around. After 1 minute, fish them out with a slotted spoon into a separate bowl. If you use Chinese broccoli, add the stalk parts to the pot first. After 30 seconds, the leafy parts go in. After a total of 1 minute, fish them all out into another bowl. Don't remove the pot from heat yet; keep it on the stove, with the lid on, on the lowest heat setting. Let the pork cool down enough to slightly warmer than room temperature. To assemble, put about a cup of rice in the center of each individual plate. Arrange the mustard greens and/or Chinese broccoli on one side. Halve the eggs lengthwise and arrange them on the side too. It's going to be a pretty full plate. Take the meat off the bone and cut it, skin and all, into bite-sized pieces. Arrange the meat on top of the rice. Spoon about ½ cup of the warm cooking liquid over the pork and the rice. Sprinkle with some cilantro leaves. Serve with the chili-garlic vinegar. You will have quite a bit of cooking liquid left. Let it cool down and freeze it for the next pot of stewed pork hocks. Good catch. Thank you. Fixed. It looks sooo good. I know what to cook this coming weekend. The dish was originated in China and spread all over Chinese community across Southeast Asia. I heard of a version that list chocolate powder as an ingredient. I guess coke or pepsi will work as well since it lends caramel color. It should also speed up the breakdown of fat and protein in pork knuckle as well. I lived in Phuket town for 6 months (teaching) and often used to get a soup that sounds similar to this for lunch. It had rice noodles and pork and crackling and hard boiled eggs and the broth was dark like this. Is this similar to or the same as that soup? Somehow I never found out what it was called before I left, and so have never been able to attempt to re-create it back home even though I missed it so. Fair Hannah – That’s kuai chap or kuai jap which is a different dish. I love Khao Man Gai however haven’t had it in years. It was always one of my favourites when lving n Thailand before. I was just at my local Thai market and they have frozen cilantro root from the mother land…big fat ones! Hopefully since they are frozen it hasn’t diminished the flavor of them, but I do plan to use them in this recipe this week. Annette – Aw, man, I’m jealous. Haven’t seen any around here. Frozen cilantro root from Thailand is far more fragrant than the ones grown locally in the united states. Either it’s in the soil or the cilantro breed/variant is different but I’ll take the frozen Thai imports over domestic ones anyday. @Annette Clovis I’m sorry but I’m wondering what motivated you to rate Nong’s recipe 4 out of 5 stars. I can’t tell what your reasons are from your comment. Did you just drop by to say something about cilantro roots and think it might be cool to rate a recipe you haven’t tried while you’re at it? i have “chinese master stock” in the freezer which i use occassionally for stewing whole pork legs (love the soles!) and pork innards, also pork belly, octopus/large squid, culled duck and stewing hen. i think its about two years old already! Now i’ll add coke to it. also coriander, but may i use sawtooth coriander(eryngium foetidum)? hard to grow coriander in my hot and humid part of the philippines in summer, and it costs twice as much as beef last time i checked. but sawtooth grows like a weed (IS a weed} in my garden. thanks a lot. Thanks for sharing the recipe, or at least for focusing some attention on this dish which I’ve been enjoying for a couple of decades in Thai joints in the Bay Area, NYC, etc. Such great comfort food. I just sampled the dish at Nong’s Take Out place in Portland a few minutes ago and have to say it was just average compared to other versions I’ve had (the worst, by the way was at King Andy Ricker’s now shuttered Ping restaurant here in Portland). It was a tad flat (maybe because it needed salt), and I’ve got to agree the pickled mustard greens for the same reasons stated in your post, but at Nong’s, fresh Chinese broccoli was the predominant vegetable, but I’m sure you can state your preference upon ordering, but it was not offered as an option. Anyway, it was fine, tasty, and so on, but almost no skin in evidence and, as I implied, the flavors were a bit thin and not quite unctuous enough for my taste. Now this is the funny part to me. I have immense regard for Nong’s achievement in creating a great little empire. She was, at least in Portland, a pioneer in her courage to offer only ONE dish from her first cart, something quite common in other cultures as we all know. And I suppose it was this genre-busting spirit that has helped garner so much attention for her—the wall of her take out place is covered with clippings from magazines and newspapers from all over the USA. But I’ve eaten her signature khao man gai many times and have to say, like the muu dish I had today, it is adequate, but not ethereal as you’d expect after reading the reams of press she’s garnered. Here in Portland, well, actually in the suburb of Beaverton, there is a place which caters more to a Thai/Lao clientele where the khao man gai is several notches better, richer, and overall more satisfying than Nong’s, with all due respect. Yet this place goes totally unnoticed in the press here, ignored by the hip self-appointed gourmands because it is slight out of the way, and has just not made it into the proper lists. But when I have an urge to eat this wonderful dish, I will drive the extra 10 miles or more past all three of Nong’s locations to eat what I consider to be a superior version of khao man gai. Your mileage may vary. Not sure why I am going into all this, perhaps because, and I know this because I used to be a working journalist, most journalists take the easy way out. They follow the neon and the tried and true, and Nong is surely that. Most food writers really don’t know very much about food, so they focus on the David and Goliath aspect of her story (which IS amazing) and are awed by what is a nice plate of food, I’ll grant you. But they have ZERO with which to compare it, and so they put it on that pedestal for which so many strive and so few achieve. It’s great to see the single-dish concept get attention, for Nong to get attention, and the ensuing success, more power to her. But I’ll stick with humble little Rama Thai in Beaverton, or the ultra funky Thai-Lao Kitchen in Wichita, Kansas, for the totally flavor-rich food I enjoy so much…and I can assure you that neither of these joints will ever make Bon Appetit, Saveur, or the NY Times. Makes getting a table just that much easier! But it’s still a bit disappointing somehow. And thanks for YOUR brilliant work! I’m addicted to your recipes, but even more so to your clever writing, your wit, and your intelligence, so rare to find these days of way-to-serious food journaling. You are a treasure! Michael – Thanks for the thoughtful comment and the kind words. As you surely have noticed, this piece is more about Nong as a cook, a business person, and a fighter than anything. I think she’s really great. I completely understand what you’re saying here. Not having tasted Nong’s food (or anything at Ping, for that matter), I can’t weigh in on the food part (I love this kha mu recipe, though!). 3. people (including the media) who previously have little knowledge of Thai food beginning to see the difference between subpar, average, good, and exceptional now that there are multiple versions of the same dish available in more places. I’m optimistic about where this is going. I am in total agreement with your summation of Nong’s importance. I should make it clear that the thrust of my comments was aimed, not at Nong, who produces some very tasty plates of food, but at the media, and the public they influence, who always go for the low-hanging fruit without really knowing what they are writing or reading about. Regarding food writers—I once had the pleasure of interviewing the great Italian chef and cookbook author Biba Caggiano in her Sacramento restaurant. Remember, she’d been interviewed dozens of times previous to our meeting by magazines, newspapers and television from all over the United States. At the end of our conversation she stated, “Mike, you are not like other food writers, you actually know something about food.” I’m relating this, not as some feather for my cap, but rather, as a reflection on the state of food journalism in this country. Not a very delicious area, I must say. P.S. When I was at Nong’s, she grabbed a broom and went outside to sweep the sidewalk in front of her shop…clearly “fame and fortune” have not gone to her head. I use to make this dish years ago . Never used cola im very intrigued. Must make it tonight!! Khao Ka Moo is one of my fav dishes. I distinctly remembered eating it when I was younger in Thailand — just like Khao Mun Gai. But I’m so afraid of cooking it by myself at home! Great recipe as my kitchen smells amazing. The spices really did a wonderful job of cutting through the sweetness of the cola. I am interested in saving the liquid for future batches. Do you continue to add spices/prepared paste to subsequent tries? Many thanks for sharing! amy – Yes. The liquid needs to be reinforced with fresh spices with each successive batch. I was skeptical of the cola, but I went ahead and followed the recipe to a T. Wow. This is good. Now I’m curious to try your aunt’s version with the cocoa powder! Khao Ka Moo looks like same recipe for Pa Lo? Russell – Yeah, pretty much. I know I’m late to the party here, but I do want to say this about Nong’s: my office is a lucky block away from her first cart. After my first taste of her wonderful dish, I became addicted! Her personality (she is regularly at the cart saying hello to people who stand in a long line to get her delicious and artfully prepared food) is authentic, charming and inviting. The result is that whenever I feel poorly–or when I feel I need something pure, I head to Nong’s cart for her simple savory broth, her perfect rice, the delicious skinless chicken breast and her always bursting with flavor sauce to pour over or dip into. If this isn’t the best in town, I look forward to trying others. What it really is: super consistently delicious!!! Thank you for highlighting another Portland pioneer who makes everyday a bit better for those of us workers out there! I made Khao Ka Moo for the first time this week, it was pretty good, but I was a bit disappointed. Indeed I didn’t get the intense flavour I remember from this dish in Thaïland. I used David Thompson recipe, with some details of your recipe, but without the Coke. I may have used too much water, since the pot I used was pretty big (I used what we call in France a Cocotte, a large cast iron pot). If I use a larger amount of water, should I use more spices, soya sauce…? I will re do it soon, re using the stock from this one. ANd I will use coke this time. Just FYI Arnaud, All of David Thompson recipe are crap. they will not give you the results you are looking for as they are mostly incomplete or butchered from the original. That’s why its better to go to the restaurant .. Believe me!!! Nongs recipe is close al except the coke.. its not used tradionally it is too expensive. However Nongs is a great recipe that can work. I suggest you follow it . rather than D.T.